Newly freezemarked “yearlings” at Palomino Valley await adoption or shipping to other facilities. 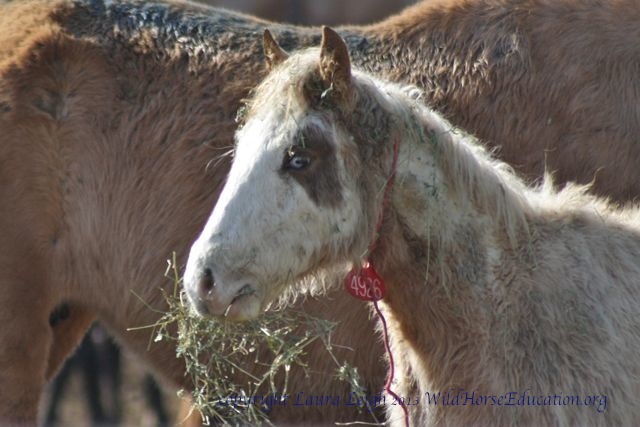 At Wild Horse Education we get many requests to read freezemarks on wild horses people find at auction or posted for sale. Many of these animals do not have papers or even an oral history about where and when that horse was captured. But the mark that the Bureau of Land Mangement places on the left side of the wild horse or burro’s neck is a key to unlock that history. In several instances people have sent us a freezemark and we have been able to provide them the history of the HMA and even a photo of that animal during or after capture. The best way to know the history of your mustang is to contact BLM and provide a clear photo of the mark. 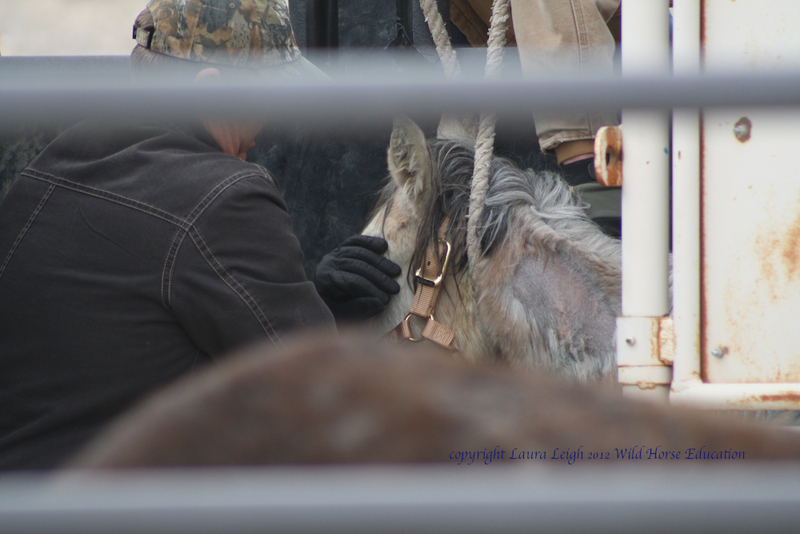 They should be able to give you an approximate capture date, age and location your wild horse is from. They may even be able to provide you with a new title for wild horses that have been adopted or sold without title transfer from owner to owner. The chosen method of the BLM to mark a horse or burro as a wild horse managed on Federally protected land is “freezebranding.” A “freezing” branding iron is used to mark the hide of an animal. Freeze branding uses extreme cold to kill the cells in the animal’s skin that produce pigmentation (color). A freeze branded animal will have white hair where the freeze branding iron touched the skin. A permanent mark, freeze branding a horse (or cow or other animal) is done for identification purposes. As feezemarking kills pigmentation in the skin that colors any hair growth so the area must first be shaved. Next the area to be branded is soaked with alcohol for two reasons; it disinfects and alcohol itself is an evaporant (coolant). To make the branding iron cold BLM uses liquid nitrogen (other substances like dry ice and alcohol may be used by ranchers to mark cattle). 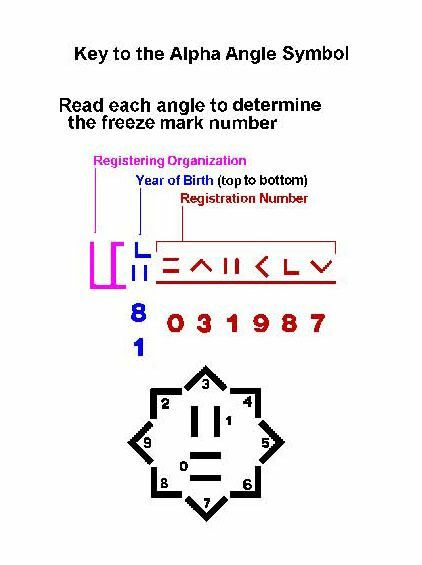 BLM sets the branding iron with a series of alpha numeric segments (will be explained later) that identify the BLM, range removed and 4 digit ID code (tag number) of the animal. It is placed in the liquid nitrogen. The branding iron is removed from the nitrogen and placed on the animals skin and held there for a few moments. If the animal moves it may require a second branding. BLM usually performs this procedure as vaccinations and worming is done at the short-term holding facility. In about three months time the hair has grown back with the branded areas white. In order to read many of the brands accurately you must re-shave the area. This is particularly true of animals that have light hair or heavy coats. “Sale Authority” horses, those that BLM has said are too old or have proven “unadoptable” get an additional large “US” symbol to ID them as “sale.” (Title transfers immediately, no waiting period). BLM website state by state coding. But that’s just a bunch of numbers, what does it mean? The large “U” looking thing means the horse was managed under the Wild Free Roaming Horse and Burro Act on BLM managed federal land. The birth year gives you the animals estimated age. The first two digits of the registration code may be the most important to the history of the animal. This two digits tell you where your horse is from. With the addition of the next four digits you can determine when your horse was removed from the range. 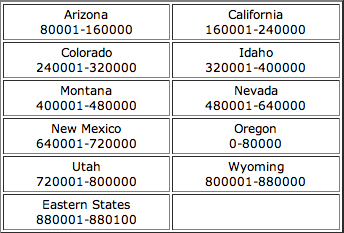 The chart to the left gives you a state by state fast overview and is on the BLM website. This chart can tell you quickly what state a horse is from. However you can get much “closer” than that by looking at BLM range codes. These digits can assist you in narrowing down the search for a freezebranded wild horse or burros “history.” EXAMPLE: If your freezebrand reads an animal is 4 years old and from a “60” coded area in Nevada you can look at the Herds with a “60” code and see what areas had a roundup in the last 4 years. Yes we know that is getting harder and harder to do as so many areas are now being rounded up as removals escalate all over the west in the last 5 years. NOTE: We will expand this page further as time allows but hope this is a good “beginning” place to track the history of a mustang you meet. This video was done at processing over three years ago when BLM used to give Laura Leigh access to such things. Leigh has not been able to view processing at this facility since 2010.